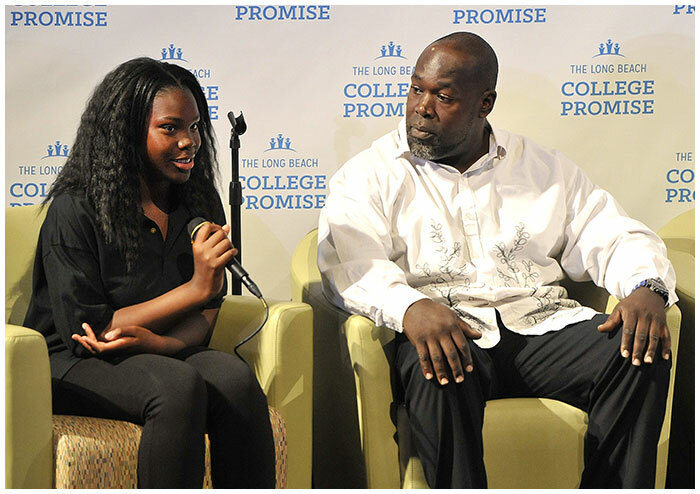 Parents and students who have benefitted from the Long Beach College Promise participated in a panel discussion recently at Cal State Long Beach to help mark the sixth anniversary of the nationally recognized program. Congressman Alan Lowenthal moderated the panel and was honored as a Long Beach College Promise Champion. Six years ago, LBUSD, Long Beach City College and CSULB committed to the College Promise, which has since provided local students with greater opportunities to pursue and complete their higher education. The College Promise has improved college access by providing key incentives and services, including tuition-free semesters at LBCC, guaranteed admission at CSULB for local students who qualify, and college preparation and guidance as early as elementary school to help children understand that college is within reach. The program’s sixth anniversary report notes a 43 percent increase in CSULB enrollment by LBUSD graduates. More than 5,600 high school graduates have benefitted from free enrollment at LBCC in the fall semester, and LBCC and LBUSD students have shown that they are more likely to remain enrolled at the university than other students. LBUSD students visit LBCC and CSULB in fourth and fifth grades, and middle school students and parents complete an education plan pledging to do what it takes to attend and succeed in college. More than 57,700 of the pledges have been signed. The College Promise has earned repeated, national recognition, and last year the Little Hoover Commission, an independent state oversight agency, recommended the College Promise as a model that should be replicated. Congressman Lowenthal, who represents the 47th Congressional District, was honored for his support of the College Promise and his legislative efforts to increase college completions during his tenure as a California state senator. While in the California Senate, he championed the Long Beach College Promise Partnership Act in 2011 to help LBUSD students better transition to LBCC. He also authored and passed the Student Success Act of 2012 to increase access and success in California community colleges by providing effective orientation, assessment and placement, counseling and other education planning services to help more students earn degrees and certificates. COLLEGE PROMISE – Nelson Academy student Cleavona Jackson was one of 25 eighth graders who received scholarships during a sixth anniversary celebration of the Long Beach College Promise. Her father, Cleavon Jackson, joined her in a panel discussion.